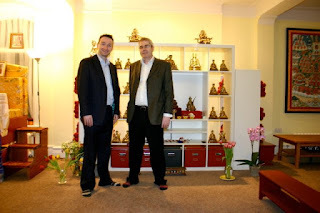 Kagyu Ling was recently paid a visit by local MP John Leech. Mr Leech had expressed an interest in visiting Kagyu Ling following the successful grant of £90,000 awarded by Veolia Environmental Trust to help with ongoing development work at Kagyu Ling. Following a tour with centre coordinator Jonathan Mackaskill, Mr Leech was treated to the customary Kagyu Ling hospitality of tea and cakes. There was discussion about the history of Kagyu Ling’s development and our plans to develop the building to provide a Buddhist Temple for the benefit of the local community, as well as to Manchester. Following this Mr Leech pledged his support to our project and any help that he could offer.